Triple Eight Race Engineering team manager Mark Dutton has credited Shane van Gisbergen for a damage-limiting drive to 10th position in Race 26 after his team’s twin unforced errors. Van Gisbergen started the day as the Virgin Australia Supercars Championship leader by 19 points but finished it 14 in arrears to Scott McLaughlin after his car was penalised for an unsafe release in pit lane. Car #97’s transgression was the end of a chain reaction which included a similar yet worse error for the sister #1 Red Bull Holden Racing Team entry as Paul Dumbrell entered the fast lane in the path of James Moffat and was hit in his side. They both dropped outside the top 20 as a result of their respective drive-throughs and even after the final pit stop cycle, Jamie Whincup was 16th and van Gisbergen 19th. That result would have left van Gisbergen 44 points behind McLaughlin at the chequered flag but the 2016 champion went on a charge which cut the deficit. 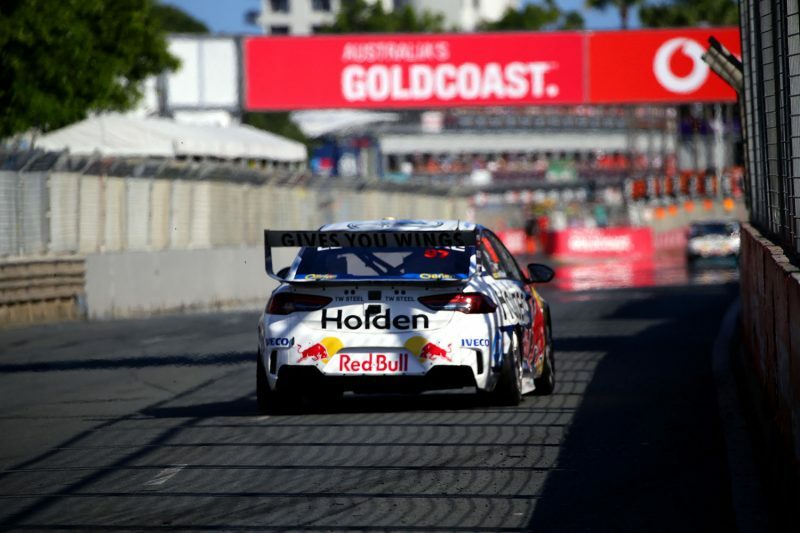 Whincup, who allowed van Gisbergen to pass easily on Lap 85, finished the first leg of the Vodafone Gold Coast 600 in 14th. “(Van Gisbergen) did massively well,” Dutton told Speedcafe.com. “The points we were haemorrhaging early after it first happened were massive. “At one point, it was about 60 and we got it down to 14. Dumbrell had led the field into the pits under Safety Car but admitted to stalling as he tried to get away from their box. That error led to the unsafe release and also further delayed Earl Bamber, who had been seventh in Car #97 and had to stack behind Car #1. After Bamber forced Garry Jacobson to brake in order to avoid contact when the Kiwi was released, both of the blue Holdens were penalised. “PD tried to merge and here it is a tight pit lane,” explained Dutton. “Murphy’s law, Car 55 (Moffat) is in his blind spot and when he sees it he is making sure he doesn’t touch any of the Penske boys who are doing the pit stuff. “There is not enough room to do a full car in a merging lane so he has gone into the fast lane and banged the door. On the far less clear-cut nature of Car #97’s penalty, he said, “There is a point where if (the following car) yields you get a penalty and a point where if it yields, you don’t. The incidents made for an error for each of the Triple Eight cars after an incident in Armor All Qualifying for Car #888. Craig Lowndes was warming up tyres on the race line when he was hit by Richie Stanaway, who was on a flyer. It saw the car issued with a five-position grid penalty, dropping Lowndes to 21st for the start of the race. While he and Steven Richards fought back to finish second, Lowndes was convinced that the series of calamities would not be met kindly by team principal Roland Dane. “I think our debrief’s going to be quite interesting,” said Lowndes post-race. “The Chernobyl bomb might go off when you see Roland walk into the room. “It’s a mistake on our behalf, they’ll (Red Bull HRT crews) investigate their side, and obviously make sure that they don’t do that again either. The Red Bull HRT cars at least still lead the teams’ championship while Lowndes/Richards extended their advantage in the Pirtek Enduro Cup standings.